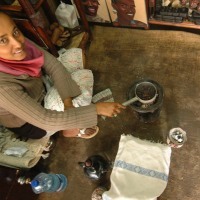 I visit a tiny souvenir shop in Addis Ababa. 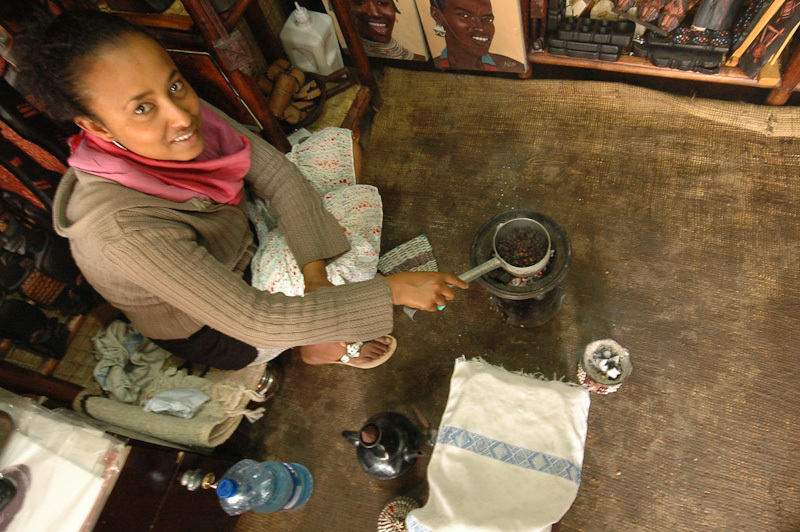 Lemlem is roasting beige coffee beans on a clay hearth. Just within minutes the sun is overcast by dark clouds and an imminent intense rain sets all the shopkeepers to action. I help Lemlem and her sister to hide merchandise inside the store. 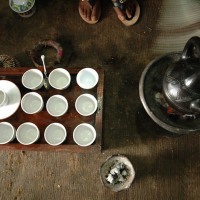 The girls invite me for a cup of Ethiopian coffee. Let’s take a closer look and follow the innocent little coffee bean from its birth until it, according to its destiny, would give the sensual aroma to our cup of coffee. Crossing various countries I often come across vast coffee plantations. Most of the plants are medium sized shrubs. The fruit is green and as it matures it also becomes slightly red. Fruit picked from a tree, just like olives, is nothing like the product in question. It is bitter, inedible and useless. The careful process of coffee making starts right from picking these green useless fruit. The coffee fruit is spread on large mats and exposed for many hours to direct sunlight. At some point the dried shells come apart and thus release the coffee beans. The next step is to carefully separate the shells from the beans. At this point our coffee beans look as they should, except for they are pale and cream-colored. We proceed to roasting. A metal vessel set over set a hearth suits perfect. 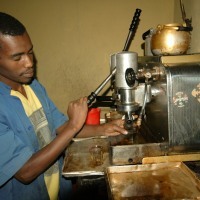 The beans soon become black and in the air you can smell the aroma of a genuine fresh coffee. The roasted beans are ready to be ground. 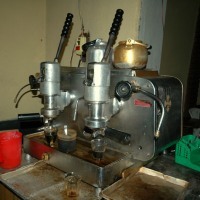 An ordinary coffee-grinder is one of the ways to do it. However, we are going to stick to the traditional methods, thus carefully pounding grains in a massive mortar. Once the water inside our clay kettle is boiling we add coffee. 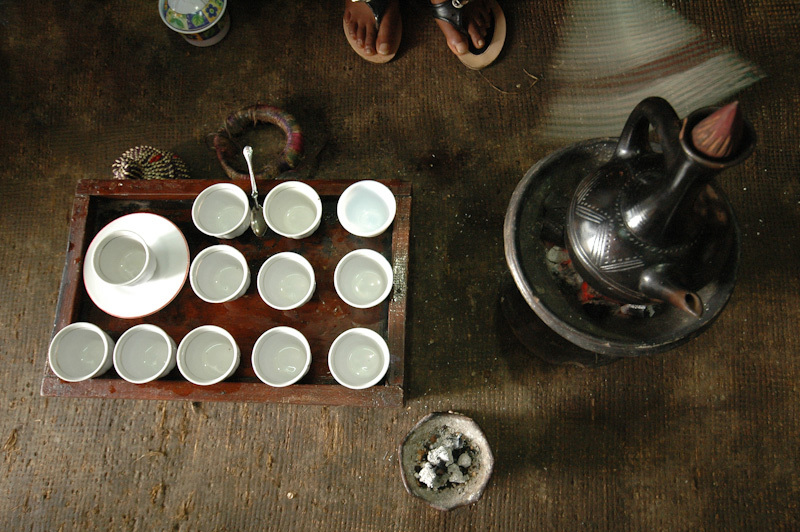 After a few minutes the coffee is ready to be poured into several tiny cups. 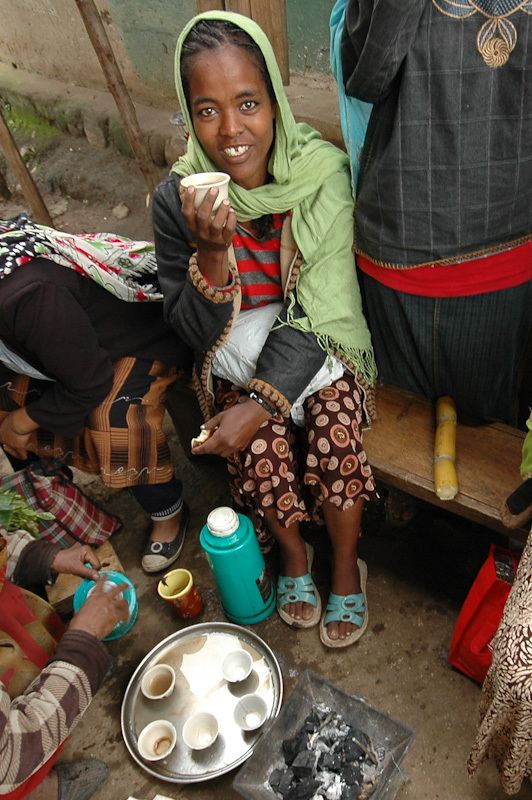 Milk straight from cow makes a perfect accomplishment to a cup of traditional Ethiopian coffee. 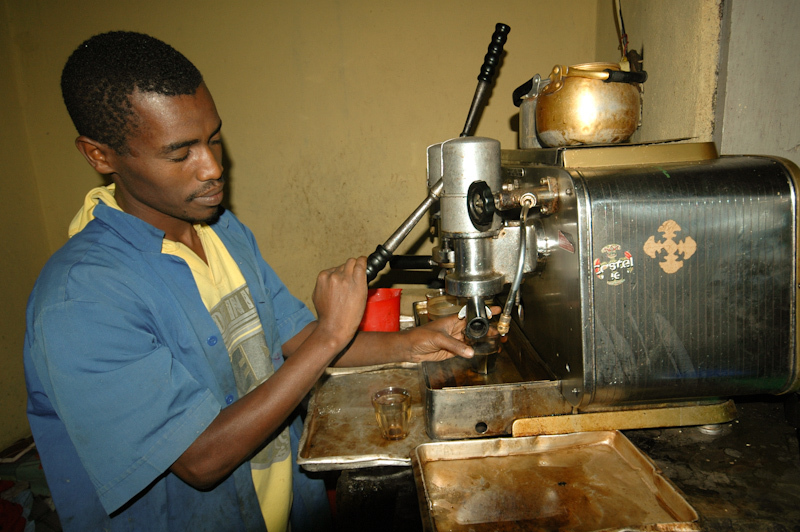 It is worth to mention that the good quality of fresh coffee makes it possible to brew the coffee twice, sometimes even three times. 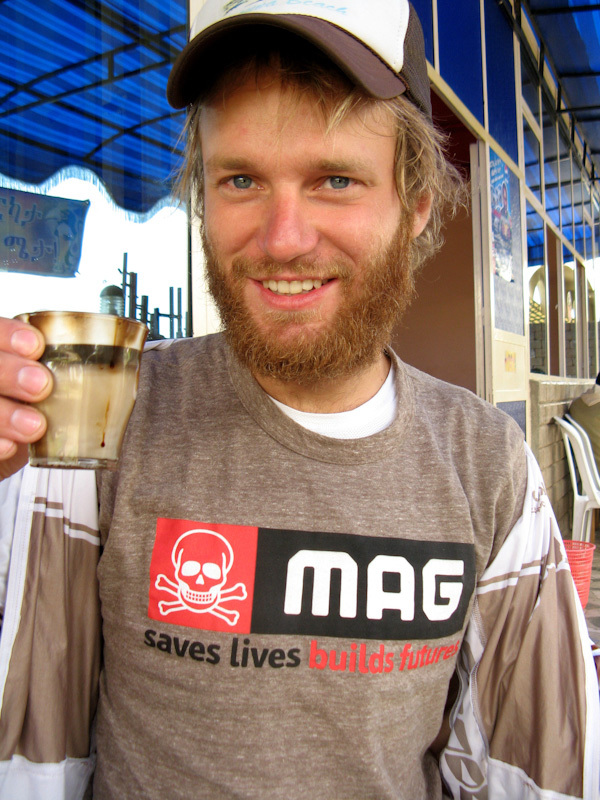 I have had a pleasure to drink coffee in plenty different countries, brewed nearly in every way possible. I also worked for almost a year in some coffee stores. Not to mention that I drink several cups of coffee a day. 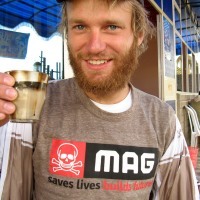 After these experiences I axiomatically admit that Ethiopian coffee in Ethiopia is simply the best in the world. 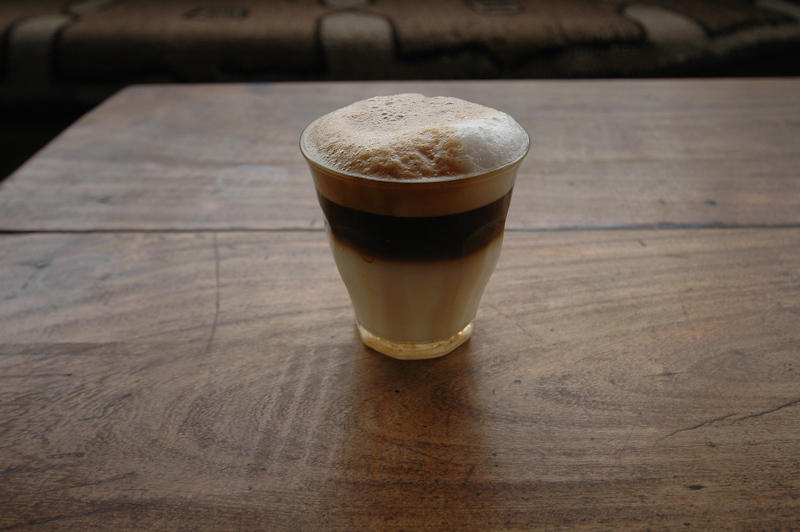 Both traditional brew as well as its modern espresso-based variations. 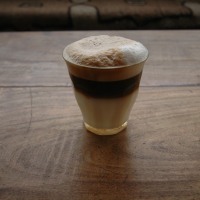 Fabulously tasty macchiato is a visible accomplishment and a showoff of barista’s craft. I am constantly impressed. 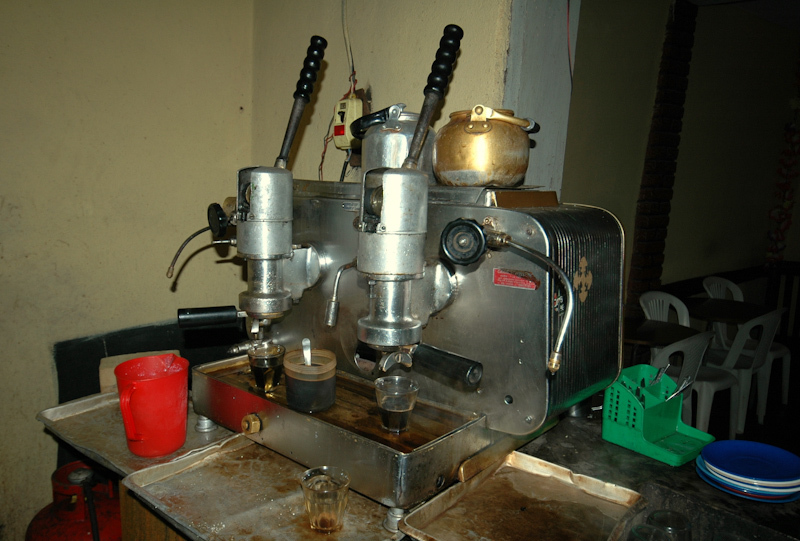 In Ethiopia you would see lots of the old Italian coffee machines, long since retired back home, here enjoying theirs second prominent lives. Honestly, it is the Italians who should learn from the Ethiopians how to brew coffee. 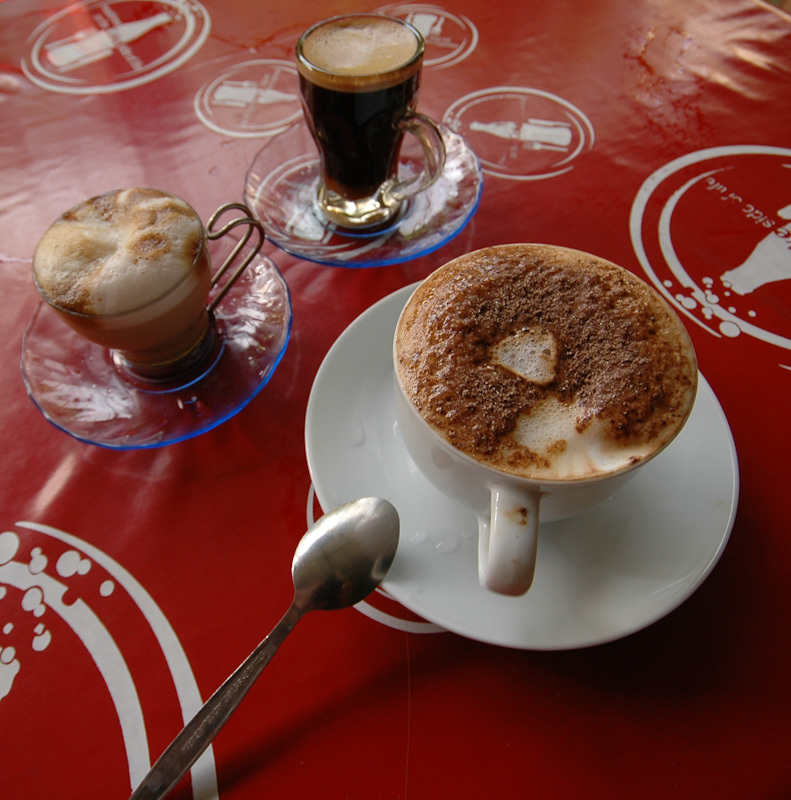 More often than not sharing a cup of coffee is accompanied by a interesting conversation. Especially when the downpour outside is having a great time. Lemlem is an interesting girl. She is also very loyal to Ethiopia. She and her sister got some start-up money from their parents to open this little souvenir shop. Just few steps away is another store run by their best friend. They girls like what they do and their everyday work is a source of happiness. During my long journey through Africa I stayed with many different people. Sometimes we talked about an ultimate place to live. The ideas were diverse. Often on the extremes. Starting at being attached to ones homeland to an irresistible desire to flee away as far as possible. The choice between Europe and Africa is like the choice between prosperity and freedom. There is no universal answer. 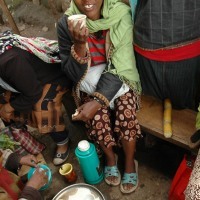 Lemlem clearly loves Ethiopia and can not imagine living permanently anywhere else than in Addis. There is also a reply I did not expect: “I would like to go to Miami for holidays!". Myself, I am happy about having found the Lemlem’s charming shop.